We left Harts Pass around 10:30am in steady light rain. 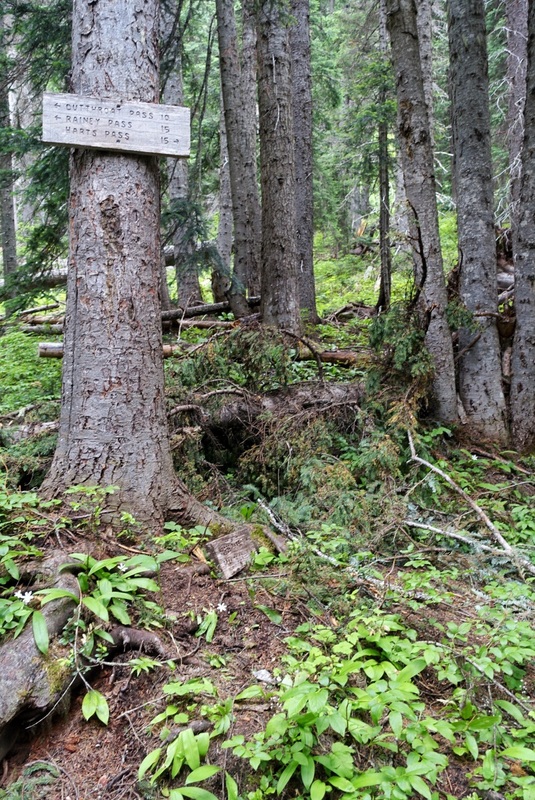 The trail immediately passes through an old burn, and we expected a lot of blowdown. We were pleasantly surprised to find only a handful, though some were fairly large. The thick mist highlighted the low green vegetation against the dark snags and imparted a mystical beauty to the same burnt forest that last August seemed barren of life as we hurried through on a hot, dry day. We had no views of anything beyond our immediate surroundings and focused instead on the numerous small wildflowers in bloom. We stopped at the Brown Bear trailhead as the rain let up, marking the last point on the PCT that will be familiar to us until we reach CA. 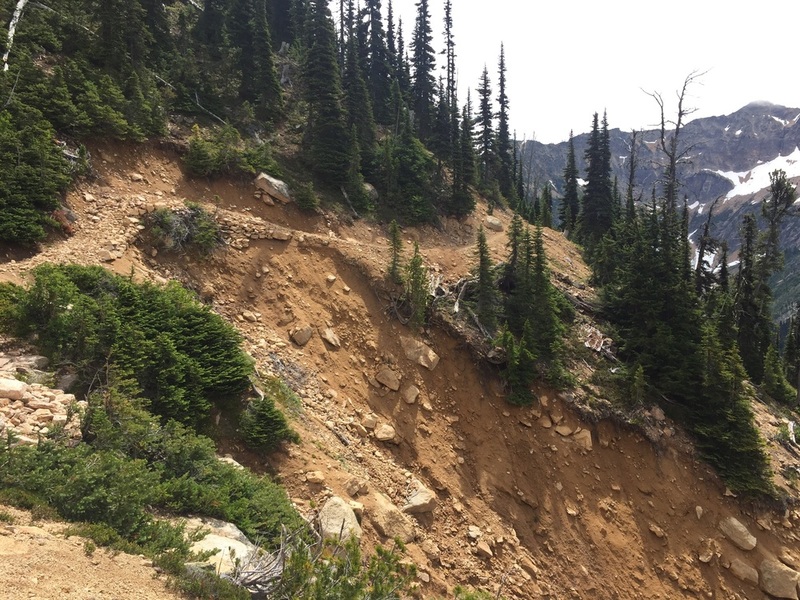 The trail makes a long meandering traverse along the shoulders of Tatie Peak, an old mining area and the site of last summer's wildfire that detoured our backpacking trip. It is typically an exposed, dry slope without water or shade but you wouldn't know that today. The mist hung low all morning as we walked on a narrow ledge of broken shale following the contour of the mountain. We remarked on tenacious wildflowers that somehow managed to grow from small cracks in the rock wall. We crossed several large snowfields in drainage basins. The surface was slushy and a bit slippery but the angle was generally low and we felt sufficiently safe kicking steps into the soft snow and left our ice axes stowed. There were a few spots where we had to scout around or even consult the GPS to determine where the trail started up again at the far edge of the snow. We kept moving to hold the damp chill at bay, though we did take a short lunch break on a foggy, snowy promontory surrounded by tamarack trees. 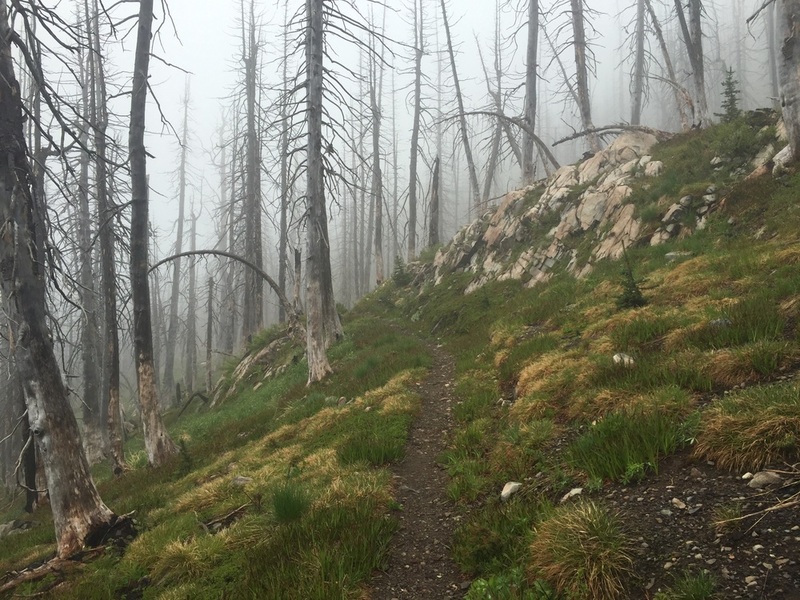 A few marginal campsites are scattered between Tatie Peak and Glacier Pass, none very appealing in the dense fog. We continued hiking though this was more mileage than we really needed due to our scheduled meeting at Rainy in a few days. Our goal was to camp at the first reasonable spot, which we thought would be at Glacier Pass. The fog suddenly lifted on the ridge above the pass revealing the deep green valley below, the U-shaped pass, and the ragged spires of Azurite Peak draped in high clouds and rising mist. We had a clear view of the switchbacks that would take us down 1200' to the pass. As we descended, we saw several fat marmots running between large rocks, and stopped to watch them for a bit. The camping options at Glacier Pass were underwhelming, heavily forested with plenty of lingering snow and no views. After a short snack break we headed further down the trail towards the next campsite near the Brush Creek bridge. As we continued to lose elevation we started to see columbine and leopard lilies again, but the trail also became overgrown with vegetation and we couldn't even see the nearby creek as it was choked with low trees and brush (hence the name?). I narrowly avoided stepping on a medium-sized brown snake, remembering that our niece Molly recently told us that there are no venomous snakes in WA west of the Cascades. Hmmmm. I wonder if being IN the Cascades counts as east or west? Our campsite near the bridge was small and surrounded by dense undergrowth but serviceable, with a clear view to the sky and a nice bench to sit on. The rain waited until we were in our sleeping bags, and was light and intermittent through the night. Day 6 dawned with patches of blue sky, and we decided to make a leisurely morning of it. We could easily hike to Rainy Pass in a day, but are meeting Andrew's family the morning of Day 8 so we have to reign it in a bit. Last summer we had planned to visit a few off-trail lakes between here and Rainy, but the fire detour changed everything. One advantage to carrying actual maps and a GPS (many thru-hikers rely on a smartphone app that just covers the trail and common resupply stops) is that we aren't limited to staying on the PCT. We scoped out Snowy Lakes and decided they'd make a great destination for today. We lingered over coffee & tea, while Andrew wrote his blog post and I finished a NYT crossword. I knew that bench would come in handy! We meandered onto the trail around 9am. Almost immediately we ran into blowdowns, frequent but isolated at first. By the time we reached the junction to the (alleged) Mebee Pass trail there were so many it seemed like a bomb had gone off in the forest. 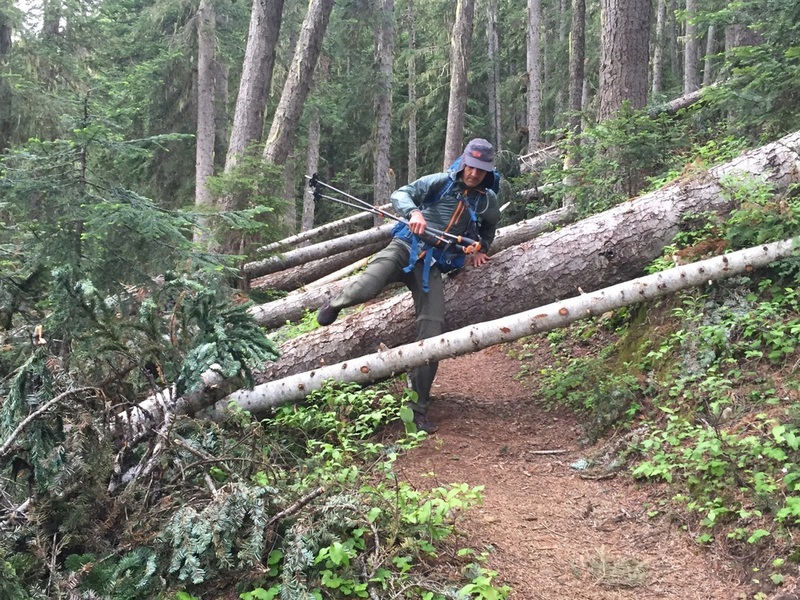 For long stretches the trail was completely obscured by layer upon layer of downed trees. We started to make a game of navigating these obstacles, classifying them as Overs, Unders, or Arounds. Of course there are sub-types. Overs include the Stepover, the Straddle, and the Clamber, and the best include a convenient stepping rock or branch. Sap, mounds of snow, and wet slippery bark keep things interesting. Variations include the Log Walk. Unders might be of the Duck, the Limbo, or the Crawl variety and degree of difficulty depends on number, length, and flexibility of protruding branches. Andrew (as you might imagine given his long legs) has an advantage in the Overs, while I'm a bit better at the Unders, though having an ice axe and crampons strapped to the outside of a pack does add to the challenge. At least we had perfect hiking weather. In any case, the blowdown nightmare continued through to the Methow River bridge. We had lunch there, not far from a guy lounging in his tent at noon - apparently stoned (the only person we saw that day). The trail then makes a steady though gradual climb and we were happy to return to regular but isolated blowdowns consisting of generally smallish-diameter trees. They continued to the Golden Creek crossing, then became even less frequent. I remembered reading about Snowy Lakes in a book on the region and recalled a use trail to access the basin. I didn't know which side of Methow Pass it came from, and it wasn't shown on any of our 5 maps (2 printed, 3 digital). Looking at the topo, it seemed more likely that the approach would be over named Snowy Lakes Pass, a longer off-trail distance but via more gradual terrain vs. approaching via the lakes' outlet from the far side of Methow. Fun Fact: Locals pronounce Methow as "MED - TAU", with no "th" sound or even any evidence of an "h". We found our first mileage "sign" just one switchback before departing the PCT for Snowy Lakes. Of course, it's based on distance from the opposite border, so it's more like a countdown for us. 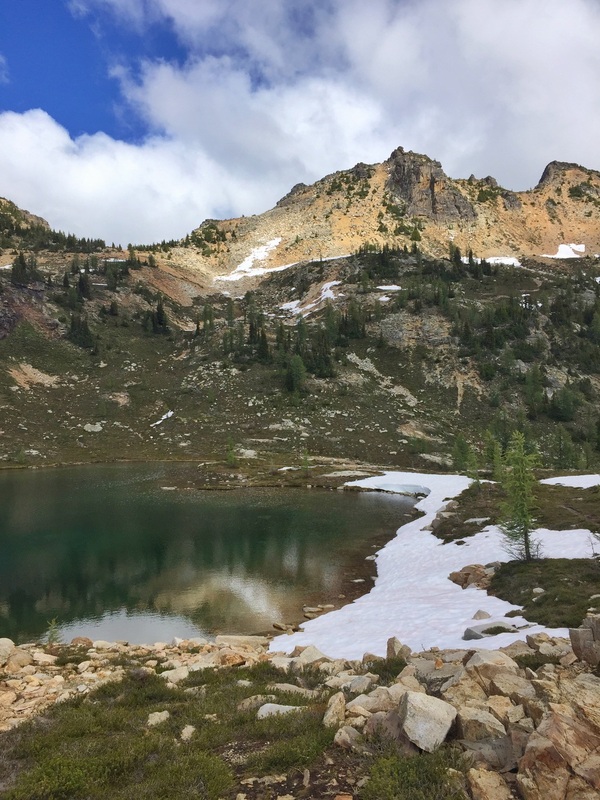 We continued on the PCT to the switchback nearest Snowy Lakes Pass and scouted for the best spot to leave the still-forested trail over rocky terrain. We set off via a small break in vegetation a few yards from the corner just as Andrew noticed a small cairn across the trail, apparently marking the spot - looks like we found the use trail. The narrow, faint path made several tight switchbacks to the edge of a clearing, where it petered out. From there we could see the entire upper basin and had a decent view of the pass, though the top section was obscured by tamaracks. 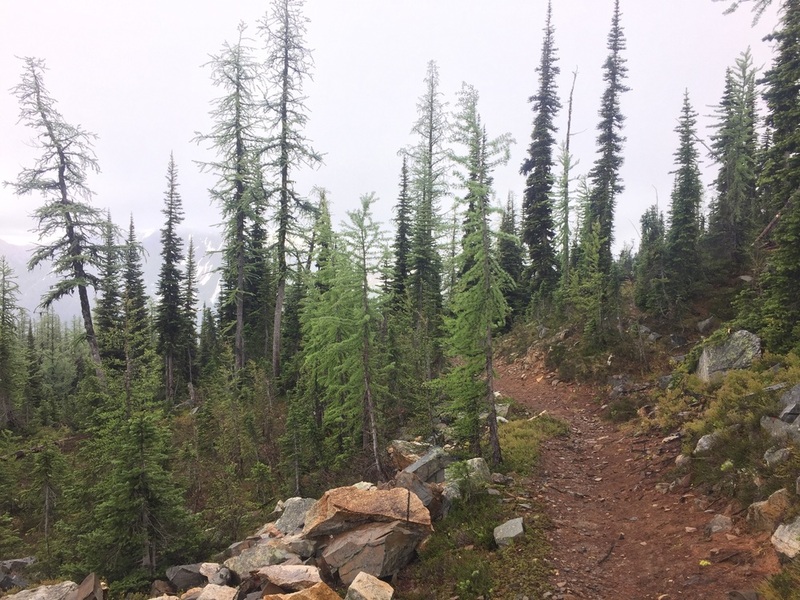 The route-finding was relatively straightforward and we were able to avoid snowfields and talus, climbing the last few hundred feet to the pass over mounds of heather between stands of tamarack and sometimes making use of small streambeds. Patchy clouds made for dramatic views of Mt Hardy as we crested the pass to look down on a stunning little green alpine lake surrounded by granite, snow, and tamaracks. The bare knob atop a yellowish scree field to its north is aptly named the Golden Horn, and blocky Tower Mtn sits to the east of this upper basin. 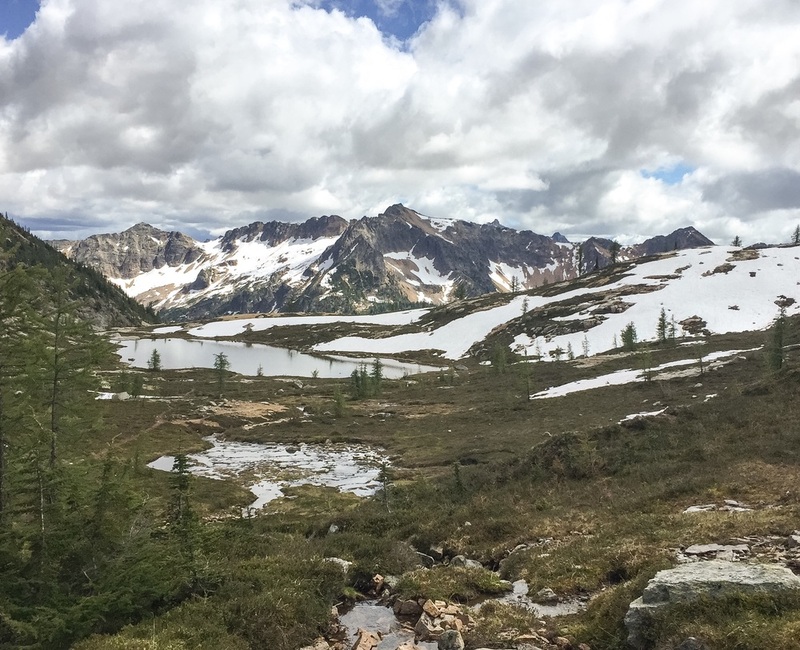 We dropped packs and scouted around the lake, finding a perfect campsite on the far side near its outlet, with views down to the lower Snowy Lake and across the valley to Cutthroat Peak and Whistler Mtn. 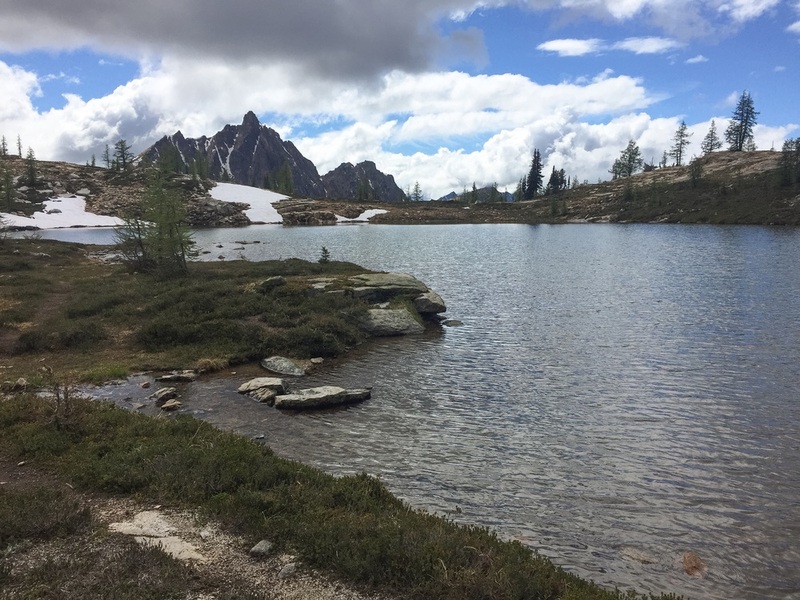 We spent an afternoon of leisure exploring this magical basin, finding a very well-established use trail that rejoins the PCT on the east (far) side of Methow that we would use to that effect the next day. You'll be shocked to hear that we retreated to the tent for an hour or so of rain before making dinner under a dramatic grey sky. As we drifted off to sleep the clouds were actually breaking up and we left the vestibule doors open with fingers crossed. We were rewarded by a clear-ish night with no rain, a visible moon (! ), and big swaths of stars in between the clouds. We woke up to very thick low mist on Day 7, completely changing the character of our high basin. Gone were all of the surrounding peaks, and we couldn't even see the lower lake. The snowfields and tamaracks appeared as ghostly shadows across the dark surface of our upper lake. There was a short period of light rain (or aggressive fog), and we lounged around in our cozy tent for hours thinking the mist might lift. We only had 7-8 miles to hike and would rather spend leisure hours in an alpine wonderland (even shrouded in mist) than choked in by vegetation along a low-elevation creek. By late morning we decided to pack up, and were surprised to find that dropping the 600' in elevation to the PCT put us below the mist. We could clearly see both Cutthroat and Whistler across the deep valley, though their tops were in clouds. Large patches of blue sky necessitated sunscreen and sunglasses (gasp). The next several miles of trail were our favorite so far. We followed the usual pattern of traversing high along slopes, this time on granite of varying states of decomposition surrounded by alpine wildflowers (penstemon, paintbrush, heather) and low, windswept trees. We pulled out crampons for a long, moderately steep, and highly exposed climb on snow to the ridge above Granite Pass and enjoyed a lunch break on a dry granite outcropping with broad views to the east and south as the sky darkened in the distance over endless rows of craggy, snow-covered peaks. The long traverse to Cutthroat Pass had several large snow-fields to cross but we only pulled out ice axes for one particularly steep and icy though small patch. Despite the changing weather we stopped frequently in this section to take pictures of the dramatic light, tamaracks, and alpine scenery. From Cutthroat Pass we passed a few sweet campsites up high but continued a rather uneventful descent to the last site possible, our staging area from which to hike the final few miles and meet Penny & Margaret at Rainy Pass early the next day for our first resupply. As per usual, it started to rain not long after we had set up our tent. We have had at least some rain every day except our first - welcome to the Pacific Northwest! 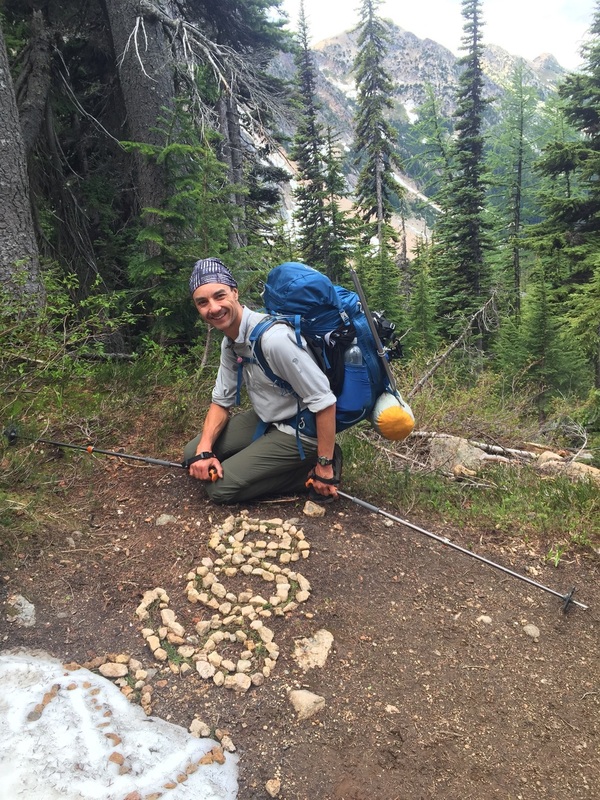 Rainy Pass marks an even 100 miles of hiking so far (37.5 bonus miles + 62.5 trail miles). Onward and southward we go.